As 2018 draws to a close we have had a fantastic year and we’ve celebrated in style with all of our team. We held our Christmas party at a rather special venue in Lichfield, St Johns House. If you are familiar with Lichfield it is the building with the white pillars on St Johns Street. The venue was exclusive to us and it felt like a family Christmas in this big old 17th century Regency House. Our team of Financial Advisers who give financial advice in Lichfield and throughout the area, surprised our support teams with a special gift for each and every one of them as a thank you for their help throughout the year. To sum up, we are a great team who enjoy working together, and working with our very valued clients. Much as we like sending Christmas cards to all our valued clients and friends, this year we have decided to do something that we think will last much longer than the 12 days of Christmas. As a team we have decided to make a special Christmas donation to our charity Buddy Bag Foundation instead of sending cards. We want to help the children who will find themselves having to flee their homes from domestic violence over the festive period. We also want to show our appreciation for the wonderful work that Karen and Chris and the volunteers at Buddy Bag Foundation https://buddybagfoundation.co.uk/ do, not just at Christmas but every day of the year. We wish each and every one of our clients a very Happy Christmas and Prosperous New Year from the whole team at Four Oaks Financial Services. We are delighted that Paraplanner Lily Jackson, Senior Administrator Emily Walker and Junior Paraplanner Nick Hepburn all passedexaminations, first time on the same day! application of all aspects of financial protection such as critical illness protection and life insurance. Nick said “I found learning about the rules on the way certain premiums or payments may be taxed differently to be especially interesting.” Nick will be studying for his Unit 1 examination early in the New Year with his colleagues in the Four Oaks Financial Services Training Academy. Lily and Emily both passed their Unit 1 examination in Financial Services Regulation & Ethics. Lily said “The exam with the lowest pass rate is Unit 3 which Emily and I have already passed but the Unit 1 examination was equally tough, because of the very wide scope of the syllabus and the knowledge you need to have.” Emily concurred, saying “There are no maths or things to calculate in this exam, this is a test of knowledge. You either know it or you don’t.” Both Lily and Emily have three examinations left to pass on their journey to achieve the Level 4 Diploma which will see them as qualified as a Financial Adviser. They are aiming to take their next examination, which will be on Pensions, late January/early February. 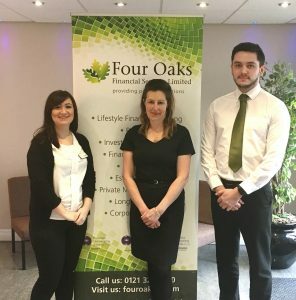 Nick, Emily and Lily are part of our extensive in-house team who provide support to our team of Financial Advisers who give financial advice local to Sutton Coldfield and across the area. Well done to all of you, studying and passing any of the financial services examinations is difficult. Congratulations. 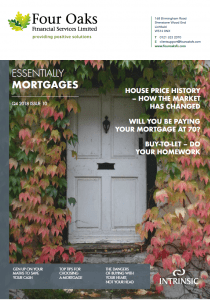 Our Essentially Mortgages Magazine Is Available Now! 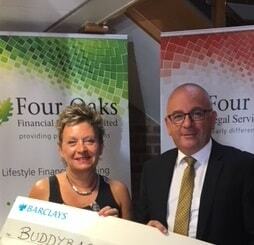 Some of our senior management team and their partners supported our charity Buddy Bag Foundation at their recent charity ball. 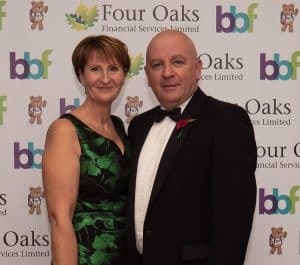 Four Oaks Financial Services who provide local financial advice in Sutton Coldfield, which is where BBF is based, not only had a table but we also sponsored the official photography backdrop. This was a wallpaper design featuring our logo and the BBF logo. The occasion was a great success raising over £7,000 for Buddy Bag which is a charity that supports children who find themselves in women’s refuges with none of their belongings. 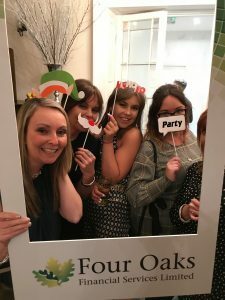 All the team at Four Oaks Financial Services are personally very keen supporters of this very worthwhile charity and we have regular events to support them. The next event will be in January when we will be packing 200 buddy bags! Beat The Clock! 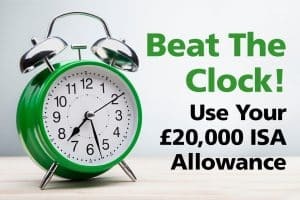 Use Your ISA Allowance Before Its Gone! Every tax year the government gives each of us an ISA allowance. This year the allowance is £20,000. The catch is that you have to use this allowance in the current tax year, that’s the 5th April 2019. Or you lose it. ISAs are tax free savings. There is no capital gains tax to pay, no tax on UK income and you don’t even have to list them on your personal tax return. The 5th April may seem a long way off, but it isn’t. 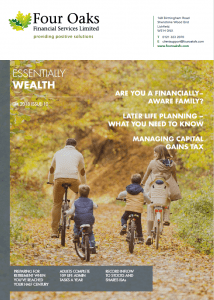 Especially if you want to take a look under the bonnet of your existing ISAs, which we strongly recommend you do, to ensure they are still performing well for you. 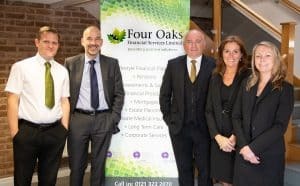 At Four Oaks Financial Services our Financial Advisers provide financial advice local to Lichfield and are qualified to give advice on ISAs. Talk to your financial adviser about the difference between Cash ISAs or Stocks & Shares ISAs.